I’ve been spending some time looking at videos of artists and how they work, the clues they give off about their organization, product preferences, etc. I’m not so much concerned about whether I like the artist’s style or the products they do use, but perhaps their reasons for what they do or what works best for them. There is a lot that can be gleaned from this, even if I look across medias. One thing I’ve learned about myself is that action carries change. If I do not take action, or I do not have an orientation to accomplish some type of change, it just won’t happen for me. So while it has been informative to watch videos and learn, unless I put some concrete steps in the development of new habits, it’s just a waste of time ultimately, or at least a pleasurable activity that could be more satisfying spent elsewhere. Like on my own art or education or recovery. But there are certain artists that interest me enough to keep watching. The artists that intrigue me are those that have done, as a practice, only the work they find satisfying. They are the artists that fill their own well by doing and experimenting. These are the artists that would (or do) work for the pleasure of it and would likely do the same stuff if they didn’t get paid. Most of them are getting paid, but I can tell pretty quickly which are participating in art as a lifestyle and which are earning a living. Don’t get me wrong. There is absolutely nothing wrong about making money as an artist on artistic work. But I am more interested, as a matter of study, in those artists that simply mind their own business and do what they want, as a practice. They teach for the fun of it, because they want to. They publish because they have something to say, even if there is hardly anyone reading. They self-publish for experimentation or to refine ideas. They make art for themselves and the world catches up with them. There may be ambition, or planning, or networking at work. I’m not suggesting that successful artists go willy-nilly along the path. If a book is in the offing, they consider whether they want to write a book now. If a gallery showing is offered, they consider if it is something they want to do. Perhaps it is not a good time to pursue such activities. The work is not a means to an end. Anyway, as I said in yesterday’s post I am a member of Teesha Moore’s Artstronauts Club™. This is a forum that Teesha wanted to explore and considered for some time before pursuing it. (I am quoting Teesha from her own writing and videos). I’ve admired Teesha and supported her various publications for more than a decade, starting with her Studio zine, Play zine, stamps, etc. Her style is very much her own and she’s evolved it over the years, sought compatible materials, hand-makes her own journals, etc. She develops her own ideas, her own projects and she just keeps doing what she wants. She takes risks. (This is my observation). She’s fine with making money, but she’s also generous in truly sharing how she does what she does. Her Club is reasonably priced and there is good value in membership. And no, I am not in any way affiliated with her. I am a customer and while she published me in the Studio zine years ago, it is not likely she remembers me and I have nothing to gain by speaking of her. I began to think how I could record and organize these observations of successful artists, so that I could assess whether a habit is worth adopting. Is it compatible with my way of working? Will it improve my life or evolve my art? I took one of Teesha’s routine practices: she constantly recycles her art. She does so by making scans and color copies of her art journal pages and cuts them up, incorporating them in a new design. It is one part of her process, not the entire process. 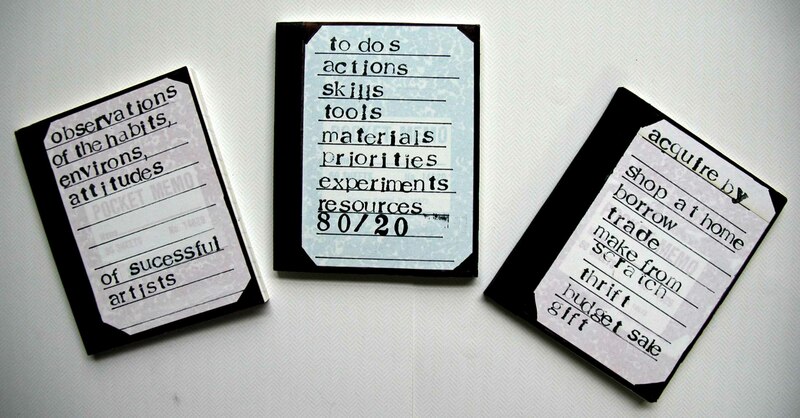 I got three mini composition notebooks from my inventory. One book is dedicated to my Observations. I approach them “scientifically” and list them in detail. Today’s focus was on the above, recycling finished art, or partially finished art, to be used in future projects in any way possible. I have already done work with my own photos, and I have already created original journal pages and canvases. I almost never take the next step to reproduce these works and use them again in some manner. For years I’ve thought about this, wanted to do this, but I haven’t. Watching Teesha do it on videos keeps bringing it into my awareness. I’m ready to take action. The second book is for Action steps. To-do lists, broken down activity by activity. Education needed, skills to develop, setting priorities. This is the how-to part of the habit. It’s not just going to happen and become a habit. There is always room for refinement, but I am building a foundation here, not a house. The last (or next?) book is the Acquire aspect. How or where do I get the education? skills? experience? What about materials and tools? How or where do I get them? What resources will it take? I have a set of re-minders on the cover as to various means of acquisition. If you’ve looked closely at the mini books, you will see the pattern and printing through the label. These are workbooks and I don’t care about that kind of stuff. Also, I picked the mini comp books because they can be held together with a rubber band and taken in my purse. While I am waiting at the doctor’s office I can review my progress or make new notes. It’s a matter of convenience and utility with me, not making a masterpiece. Which brings me to today’s experience. I wanted to reinforce the composition book bindings. I like the black tape and wanted to put another layer of black masking tape on. I was sure I had a roll of black masking tape, and I was just at the store buying colored masking tape and I know they didn’t have any black, and it’s been wicked hard to find the colored. I’ve just done a total studio reorganization and if it’s not in the “adhesives” bins I don’t have it. Guess what? I don’t have any. I was going to put it on my “to buy” list but that didn’t help me this morning. I wondered, where will I find it? Then I remembered the last time I saw some at Michael’s™ it was in the drafting section and it was about $9.99 a roll. I don’t want to pay that. I looked at my Acquire list. I had already tried to Shop at Home. Borrow: nobody here in the hood would likely have black masking tape and I’d rather not go door to door. Ditto with Trade. Then I hit Make From Scratch. I had watched a video about making your own custom washi tape, which included both painting and stamping plain masking tape. So I pulled out a roll of blank masking tape and a bottle of black gesso and I placed the piece of tape on waste backing from Contact Paper™ I had used (it’s a paper that nothing sticks to, similar to a Teflon™ pad but way free). Gesso’d it, let it dry, cut it and applied it, not even five minutes of effort. Result: 1) I didn’t spend too much money on a roll of black tape; 2) I wished I had remembered all this before I paid almost $5 a roll for the neons I found last week (although I am a masking tape fiend and it is something I use over and over, but still); 3) no time and gas trying to find it in a store; 4) able to finish project immediately. A side note: Sam’s Club™ sells 6 rolls or so of regular masking tape for about $12. That’s a lot of masking tape. Make your own washi tape, you already have stamps and paint and ink pads. Have you priced washi tape? Half of it doesn’t even stick properly and the designs aren’t to my liking (unless they are even more expensive Japanese designs). Keep pieces of masking tape on freezer paper handy. Next time you have leftover acrylic paint, or your spray bottles out, go to town. Same with stamps. Give it some thought. Decide on a successful person you admire. (Doesn’t have to be an artist, either). Learn about them. Write down the habits you feel drawn to, make a detailed action plan, figure out how to do it. Put it into practice. Remember, just because it works one way for a person, doesn’t mean it will work for you. Customize it or leave it be. What’s the worst that can happen?